The Union of European Football Associations (UEFA /juːˈeɪfə/ yoo-AY-fə; French: Union des Associations Européennes de Football;[a] German: Vereinigung Europäischer Fußballverbände)[b] is the administrative body for association football, futsal and beach soccer in Europe, although several member states are primarily or entirely located in Asia. It is one of six continental confederations of world football's governing body FIFA. UEFA consists of 55 national association members. UEFA represents the national football associations of Europe, runs nation and club competitions including the UEFA European Championship, UEFA Nations League, UEFA Champions League, UEFA Europa League, and UEFA Super Cup, and controls the prize money, regulations, and media rights to those competitions. Henri Delaunay was the first general secretary and Ebbe Schwartz the first president. The current president is Aleksander Čeferin, a former Football Association of Slovenia president, who was elected as UEFA's seventh president at the 12th Extraordinary UEFA Congress in Athens in September 2016, and automatically became a vice-president of the world body FIFA. UEFA was founded on 15 June 1954 in Basel, Switzerland after consultation between the Italian, French, and Belgian associations. The European football union began with 25 members; that number doubled by the early 1990s as new associations were born out of the fragmentation of the Soviet Union, Yugoslavia and Czechoslovakia into their constituent states. Until 1959 the main headquarters were located in Paris, and later in Bern. In 1995, UEFA headquarters were transferred to Nyon, Switzerland. 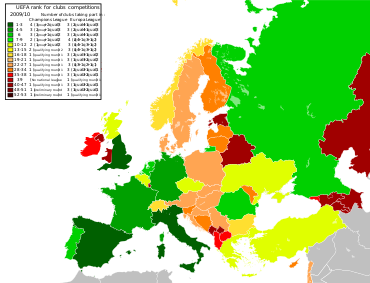 UEFA membership coincides for the most part with recognition as a sovereign country in Europe, although there are some exceptions. Some states (Monaco and Vatican City) are not members. Some UEFA members are not sovereign states, but form part of a larger recognised sovereign state in the context of international law. These include Northern Ireland, Scotland, England and Wales (countries of the United Kingdom), Gibraltar (British Overseas Territory), the Faroe Islands (autonomous country within Denmark), and Kosovo (disputed territory and partially recognised state), however in the context of these countries government functions concerning sport tend to be carried at the territorial level coterminous with the UEFA member entity. Some UEFA members are transcontinental states (Azerbaijan, Georgia, Kazakhstan, Turkey and Russia) and others are considered part of Europe both culturally and politically (Armenia and Cyprus). Countries which had been members of the Asian Football Confederation (AFC) were also admitted to the European football association, particularly Israel (because it had been banned from the AFC group in 1974) and Kazakhstan. Additionally some UEFA member associations allow teams from outside their association's main territory to take part in their "domestic" competition. AS Monaco, for example, takes part in the French League (though a separate sovereign entity); Welsh clubs Cardiff City, Swansea City and Newport County A.F.C. participate in the English League; Berwick Rangers, situated in England, play in the Scottish Professional Football League. Derry City, situated in Northern Ireland, plays in the Republic of Ireland-based League of Ireland and the 7 native Liechtensteinian teams play in the Swiss Leagues. ^ Founded as Comité Français Interfédéral in 1907, a predecessor to the current federation. ^ The current French FA, the French Football Federation (in its previous incarnation, the Comité Français Interfédéral), replaced the USFSA in 1907. ^ Former member of the Asian Football Confederation (1954–1974), joined UEFA as several AFC teams refused to play against them. See also Foreign relations of Israel and International recognition of Israel. ^ Israel had been an associated member of UEFA since 1992, therefore Israeli clubs were entitled to take part in the 1992–93 and 1993–94 UEFA club competitions despite Israel not being a full UEFA member. ^ Former member of the Asian Football Confederation (1994–2002), joined UEFA. ^ Founded as Związek Polski Piłki Nożnej (part of the disintegrated Austrian Football Union) in 1911, a predecessor to the current federation. Football Association of Yugoslavia (1954–1992); in 1992 Yugoslavia collapsed, with various federal republics becoming independent states, leaving only Serbia and Montenegro as part of FR Yugoslavia (which was renamed the State Union of Serbia and Montenegro in 2003); the Football Association of Serbia and Montenegro was acknowledged as the direct successor of Football Association of Yugoslavia. Four other successor republics formed their own football organisations. Football Association of Serbia and Montenegro (1992–2006); in 2006 the union state was dissolved with the Football Association of Serbia becoming its successor. Montenegro, which exited the union, created the Football Association of Montenegro. It competed as FR Yugoslavia until 2003 when the country changed its name to Serbia and Montenegro. Football Association of Czechoslovakia (1954–1993), became Football Association of the Czech Republic and Slovak Football Association with the Football Association of the Czech Republic acknowledged as its direct successor. UEFA runs official international competitions in Europe and some countries of Northern, Southwestern and Central Asia for national teams and professional clubs, known as UEFA competitions, some of which are regarded as the world's most prestigious tournaments. The UEFA is the organiser of two of the most prestigious competitions in international football: The UEFA European Championship and the UEFA Nations League. The main competition for men's national teams is the UEFA European Championship, started in 1958, with the first finals in 1960, and known as the European Nations Cup until 1964. It is also called UEFA or the EURO. The UEFA Nations League is the second tournament of the UEFA and was introduced in 2018. The tournament largely replaced the international friendly matches previously played on the FIFA International Match Calendar. It will be played every two years. UEFA also runs national competitions at Under-21, Under-19 and Under-17 levels. For women's national teams, UEFA operates the UEFA Women's Championship for senior national sides as well as Women's Under-19 and Women's Under-17 Championships. UEFA also organised the UEFA–CAF Meridian Cup with CAF for youth teams in an effort to boost youth football. UEFA launched the UEFA Regions' Cup, for semi-professional teams representing their local region, in 1999. In futsal there is the UEFA Futsal Championship and UEFA Futsal Under-21 Championship. Despite the existence of UEFA's Futsal and Beach soccer committee, UEFA does not organise any beach soccer competitions. International and club beach soccer competitions for UEFA members are organised externally by Beach Soccer Worldwide. The Italian, German, Spanish, French and Russian men's national teams are the sole teams to have won the European football championship in all categories. The top-ranked UEFA competition is the UEFA Champions League, which started in the 1992/93 season and gathers the top 1–4 teams of each country's league (the number of teams depend on that country's ranking and can be upgraded or downgraded); this competition was re-structured from a previous one that only gathered the top team of each country (held from 1955 to 1992 and known as the European Champion Clubs' Cup or simply the European Cup). A second, lower-ranked competition is the UEFA Europa League. This competition, for national knockout cup winners and high-placed league teams, was launched by UEFA in 1971 as a successor of both the former UEFA Cup and the Inter-Cities Fairs Cup (also begun in 1955). A third competition, the UEFA Cup Winners' Cup, which had started in 1960, was absorbed into the UEFA Cup (now UEFA Europa League) in 1999. In December 2018, UEFA announced the creation of a third club competition, with a working title of Europa League 2 (UEL2). The competition would feature 32 teams directly in 8 groups of 4, with a knockout round between the second placed teams in UEL2 and the third placed teams in the Europa League, leading to a final 16 knockout stage featuring the eight group winners. UEFA announced that the first edition of the competition begins in 2021 . In women's football UEFA also conducts the UEFA Women's Champions League for club teams. The competition was first held in 2001, and known as the UEFA Women's Cup until 2009. The UEFA Super Cup pits the winners of the Champions League against the winners of the Europa League (previously the winners of the Cup Winners' Cup), and came into being in 1973. The UEFA Intertoto Cup was a summer competition, previously operated by several Central European football associations, which was relaunched and recognised as official UEFA club competition by UEFA in 1995. The last Intertoto Cup took place in 2008. The European/South American Cup was jointly organised with CONMEBOL between the Champions League and the Copa Libertadores winners. Only five teams (Juventus, Ajax, Manchester United, Bayern Munich and Chelsea) have won each of the three main competitions (European Cup/UEFA Champions League, European Cup Winners' Cup/UEFA Cup Winners' Cup and UEFA Cup/UEFA Europa League), a feat that is no longer possible for any team that did not win the Cup Winners' Cup. There are currently eight teams throughout Europe that have won two of the three trophies; all but one have won the Cup Winners' Cup, four require a win in the Champions League and four require a UEFA Europa League win. Juventus of Italy was the first team in Europe—remaining the only one to date (2015)—to win all UEFA's official championships and cups and, in commemoration of achieving that feat, have received The UEFA Plaque by the Union of European Football Associations on 12 July 1988. UEFA's premier futsal competition is the UEFA Futsal Cup, a tournament started in 2001 which replaced the former Futsal European Clubs Championship. This event, despite enjoying a long and well-established tradition in the European futsal community, dating back to 1984, was never recognised as official by UEFA. ^ Including East Germany and West Germany. ^ Including the Soviet Union. PlayStation is the brand advertised. Dissatisfied fans across Europe have referred to the organisation as UEFA mafia, including in Russia's top league, in Bulgaria's top league, and in a Champions League group stage match held in Sweden. The term has also been covered for its use outside of stadiums, for example during a protest in Kosovo outside an EU building following the Serbia v Albania (UEFA Euro 2016 qualifying) match. Following the 2015 FIFA corruption case, the current president of UEFA, Michel Platini, was also involved himself in the case. Swiss prosecutors accuse FIFA president Sepp Blatter of making a "disloyal payment" of $2m (£1.6m) to Mr Platini. Swiss attorney general, Michael Lauber, stated: "We didn't interview Mr Platini as a witness, that's not true. We investigated against him in between as a witness and an accused person". Both Platini and Sepp Blatter are currently under formal investigation by FIFA's independent ethics committee. On 8 October 2015, Platini was provisionally suspended for 90 days from any football-related activity. Annual revenue comparison. All figures in Euros. Source is the Deloitte 2015 annual report, which uses 2013–14 figures. ^ There was no Third Place match in 1930; The United States and Yugoslavia lost in the semi-finals. FIFA recognizes the United States as the third-placed team and Yugoslavia as the fourth-placed team using the overall records of the teams in the 1930 FIFA World Cup. ^ Austria qualified in 1938, but withdrew to play as part of Germany after being annexed. ^ a b c d FIFA considers that the national team of Russia succeeds the USSR, the national team of Serbia succeeds Yugoslavia/Serbia and Montenegro, the national team of Czech Republic succeeds Czechoslovakia, and the national team of Germany succeeds West Germany and East Germany. ^ Israel competed as Eretz Yisrael (Land of Israel) in 1934 and in 1938, with a team consisting exclusively of Jewish and British footballers from the Palestine Mandate. ^ Republic of Ireland competed as the Irish Free State in 1934 and then as Ireland in 1938 and 1950. ^ a b Russia's best result is quarter-finals in 2018. However, FIFA considers Russia as the successor team of the USSR. ^ There was no official World Cup Third Place match in 1930; The USA and Yugoslavia lost in the semi-finals. Currently, FIFA recognizes USA as the third-placed team and Yugoslavia as the fourth-placed team, using the overall records of the teams in the 1930 FIFA World Cup. * – Inactive for more than 18 months and therefore not ranked. ^ pronounced [ynjɔ̃ dez‿asɔsjasjɔ̃ øʁɔpeɛn də futbol]. ^ pronounced [fɛɐ̯ˈʔaɪnɪɡʊŋ ɔʏʁoˈpɛːɪʃɐ ˈfuːsbalfɛɐ̯ˌbɛndə]. ^ "Čeferin elected as UEFA President". UEFA. Retrieved 14 September 2016. ^ uefa.com. "President - About UEFA - Inside UEFA – UEFA.com". UEFA.com. Retrieved 7 July 2018. ^ uefa.com (2 January 2014). "1954-80 - History - About UEFA - Inside UEFA – UEFA.com". UEFA.com. Retrieved 15 May 2018. ^ "History of the UEFA Super Cup". uefa.com. Retrieved 21 August 2006. ^ "1973: Ajax enjoy early success". uefa.com. Retrieved 5 January 2016. ^ "uefa.com – UEFA Cup Winners' Cup". uefa.com. Archived from the original on 3 May 2010. ^ "History of the UEFA Intertoto Cup". uefa.com. Archived from the original on 8 December 2013. Retrieved 14 August 2009. ^ "History of the UEFA/CONMEBOL Intercontinental Cup". uefa.com. Archived from the original on 8 December 2013. Retrieved 14 August 2009. ^ "Un dilema histórico". El Mundo Deportivo's Historical Archive (in Spanish). Retrieved 23 September 2003. ^ "Edición del $dateTool.format('EEEE d MMMM yyyy', $document.date), Página $document.page - Hemeroteca - MundoDeportivo.com". ^ Chelsea qualified for Europa League's Round of 32 after finished in third place in the group stage of the 2012–13 Champions League. ^ "The man with the golden touch". uefa.com. Retrieved 27 August 2004. ^ "List of European official clubs' cups and tournaments". uefa.com. Retrieved 21 August 2006. ^ "Sorteo de las competiciones europeas de fútbol: el Fram de Reykjavic, primer adversario del F.C. Barcelona en la Recopa" (PDF) (in Spanish). La Vanguardia. 13 July 1988. p. 53. Retrieved 15 November 2009. ^ "Tutto inizio' con un po' di poesia". gazzetta.it. ^ "Nissan becomes an official partner". UEFA.com. 7 April 2014. ^ UEFA (9 July 2012). "Gazprom becomes an official partner". Retrieved 13 July 2012. ^ "UEFA Media Services" (PDF). Retrieved 24 July 2011. ^ "PepsiCo scores the UEFA Champions League". ^ "Hankook to sponsor of UEFA EUROPA LEAGUE". UEFA.com. Union of European Football Associations. 10 July 2012. Retrieved 17 July 2012. ^ "FedEx to be main UEFA Europa League sponsor". UEFA.com. 15 May 2015. ^ Rent-A-Car, Enterprise. "Enterprise Rent-A-Car Sponsors UEFA Europa League to Engage European Audiences". www.prnewswire.co.uk. Retrieved 7 July 2018. ^ "Inter Milan v Napoli as it happened". BBC Sport. 19 October 2014. Retrieved 1 April 2016. ^ "Why Uefa and Bulgaria must act over 'yes to racism' banner". The Guardian. 7 October 2014. Retrieved 1 April 2016. ^ "Malmo fans sing 'UEFA Mafia' chant during Champions League defeat to Juventus". Eurosport. 27 November 2014. Retrieved 1 April 2016. ^ "Kosovo Albanians protest UEFA ruling; Serbia FM and Serbian FA reaction". Associated Press. 24 October 2014. Retrieved 1 April 2016. ^ "Fifa scandal: Michel Platini drawn closer to Blatter case". bbc.com. 30 September 2015. Retrieved 30 September 2015. ^ "Platini says the SFr2m was contracted, Lauber says he is under investigation". insideworldfootball.com. 30 September 2015. Retrieved 30 September 2015. ^ "Sepp Blatter, Michel Platini & Jerome Valcke suspended". BBC Sport. 8 October 2015. Retrieved 8 October 2015. ^ "Annual Review of Football Finance – Highlights". Deloitte. June 2015. ^ "The FIFA/Coca-Cola World Ranking - Ranking Table - European Zone - FIFA.com". FIFA.com. Retrieved 2 July 2018. ^ "The FIFA Women's World Ranking - European Zone - FIFA.com". FIFA.com. Retrieved 3 April 2018. ^ a b c d e f "UEFA Executive Committee". UEFA. Retrieved 14 September 2016. ^ "Florence Hardouin". UEFA. 18 June 2016. Retrieved 15 November 2016. ^ FIFA.com. "Football Confederations - UEFA - FIFA.com". www.fifa.com. Wikimedia Commons has media related to UEFA. Union of European Football Association, Soccerlens.com. Retrieved: 9 October 2010.